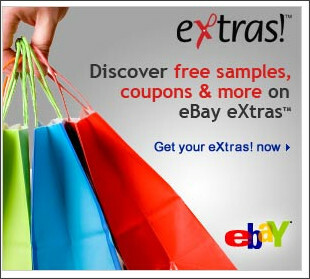 eBay eXtras: Coupons, Free Samples & More! I was browsing around eBay and came across eBay eXtras. Go here to check it out! There are FREE SAMPLES to sign up for (like Quaker Oatmeal Squares, Dove Daily Treatment Conditioner, Shout Color Catcher & more!)! And you can even print coupons! I'm not sure if you have to have an eBay account to access this . . . please let me know! FREEBIE: U by Kotex Free Sample Pack! Pure Protein Bars only .83 at Amazon! FREE Mother's Day Card at Tiny Prints! FREE HP Multipurpose Bright Paper at Staples!